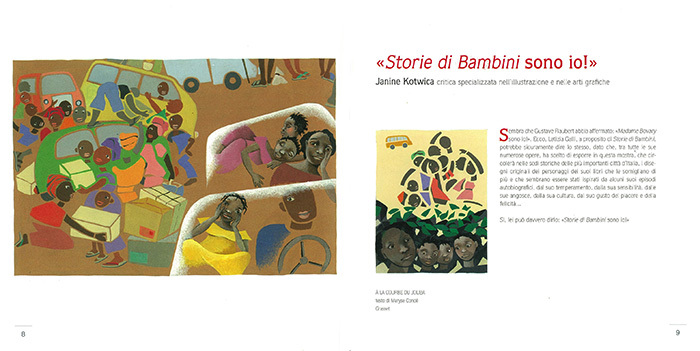 Catalogue for the “Stories of Children” exhibition, Franco Cosimo Panini Editore 2016. 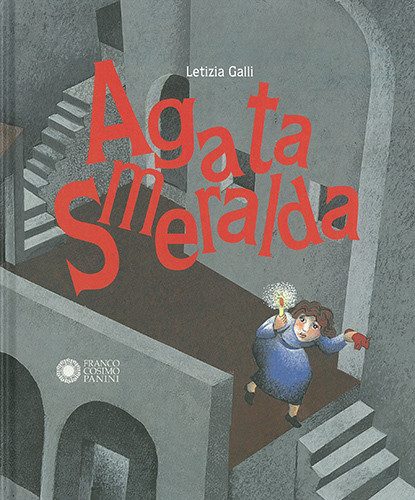 The story of Agata Smeralda was written by the artist Letizia Galli, who subsequently created the illustrations for the book of the same name, published by Edizioni Panini specifically for the occasion of the “Stories of Children” exhibition. The exhibition will be held in Florence at the Museo degli Innocenti from 25th March to 28th May 2017, following on from the exhibition’s first leg at the Real Casa dell’Annunziata. 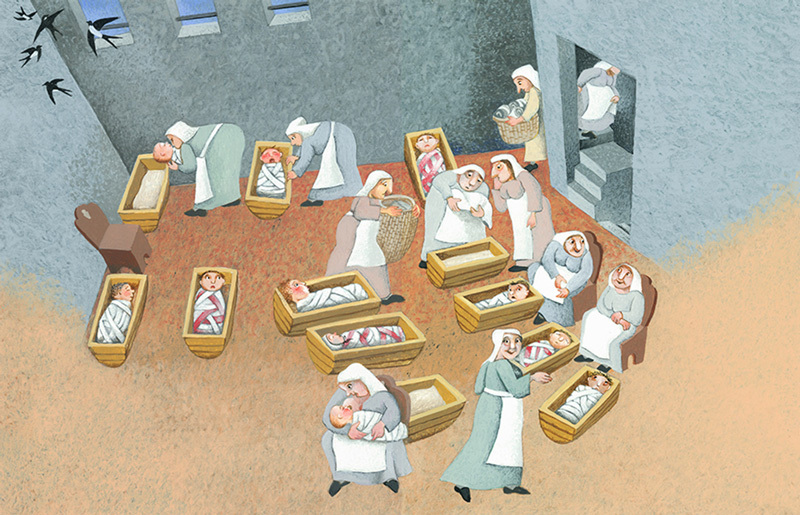 The story is one of pure invention, inspired by that of the first baby girl left on the feast day of Sant’Agata within the “baby hatch” on 5th February 1445. 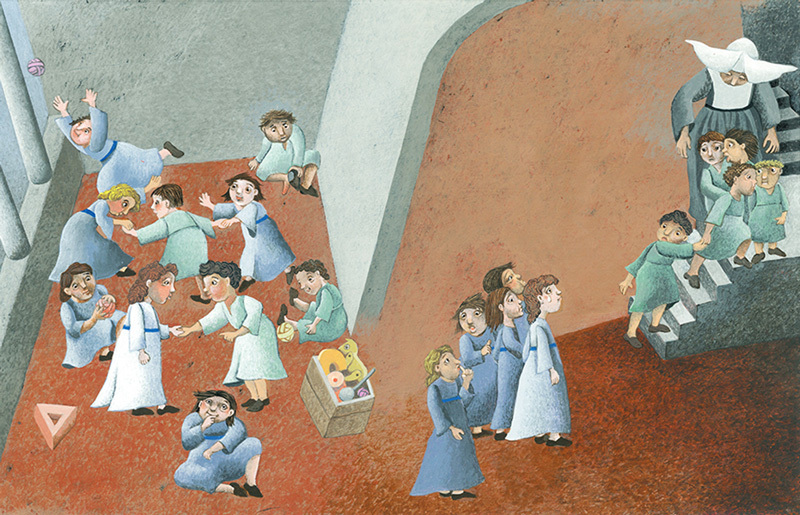 The new Spedale degli Innocenti had just been completed and the activity of providing refuge to children began with her. 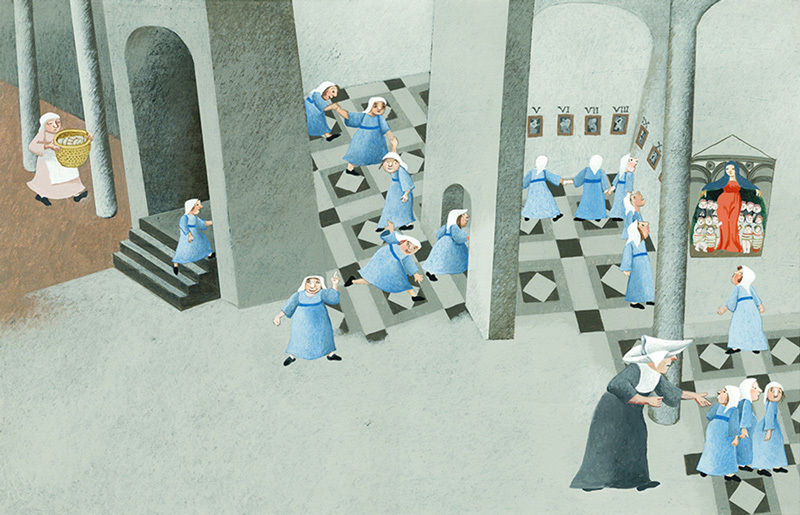 As the book reveals, Agata will manage to invent a world of her own and equip herself with the strength and courage to escape from the destiny of the girls, orphaned just like her, who would have either remained to work at the Spedale, been put to work in the homes of the Florentine nobles, or been destined to an “arranged” marriage. Instead, she pursues an ideal of freedom and self-determination. << In una notte scura senza luna le pietre della grande piazza risuonarono al passaggio di una carrozza. Due grandi mani ruvide mi afferrarono stringendomi e mi portarono fuori nel freddo. Poi la stretta si allentò no ad abbandonarmi su un duro giaciglio ancora più freddo. 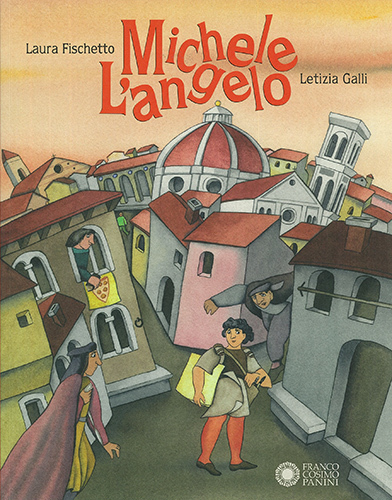 This book describes the imaginative reality of Michelangelo as a child and of the conflicting wishes of his father, who finally – albeit reluctantly – agrees to send him off to be an apprentice in the workshop of Domenico Ghirlandaio. It continues with his fight against the adverse opinions and the many diatribes of this genius who grew up in the middle of the Florentine Renaissance. The story is also based on a number of anecdotes of that time, concluding with the most famous sculpture in the world, the David, executed from a single block of marble when Michelangelo was only twenty-five years old. 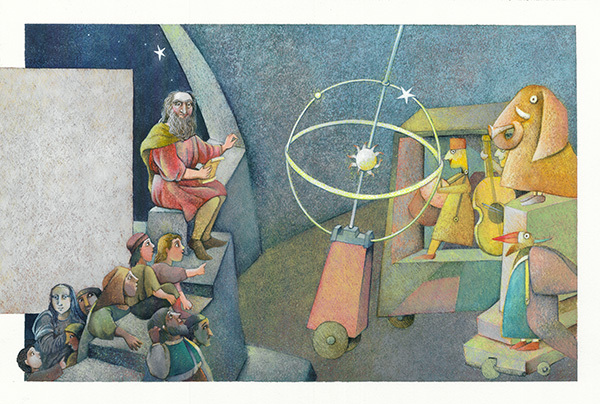 The life of Leonardo da Vinci, revealing him as a rebellious and unconventional genius. 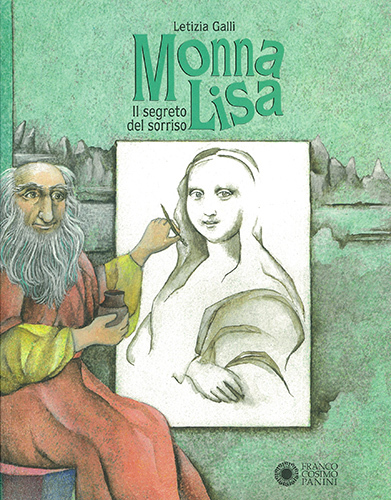 This book predominately speaks about Leonardo, who showed his strong character and independent spirit from when he was a child. Leonardo was also a refined and meticulous observer of many other facets of daily life, which was not necessarily well-known by the public. In fact, the book naturally mentions his greatest works, but also his special nature for which he became famous all throughout Europe at a certain point in his life. He was the largest organiser of parties and weddings, taking care of everything from the flowers, fabrics, place settings and music, to pyrotechnic displays and much more. It continues through to the magical and famous portrait of the Mona Lisa, who still intrigues scholars to this day. 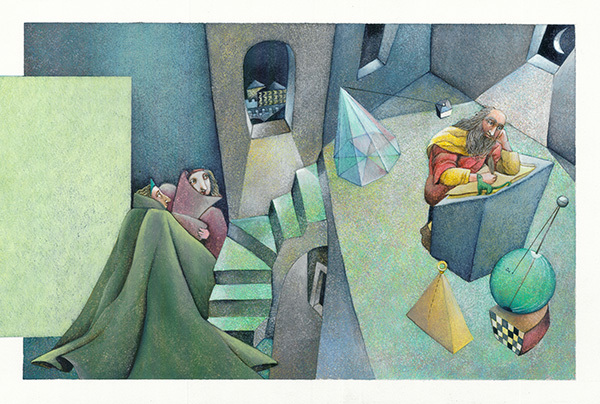 Just like the other two that follow, this book tells the story of a very simple object that all children have probably possessed or seen – a ball. Thinking about where it came from, who owned it before, where it had been bought, stimulates the child to reflect on the “history” of the objects that surround them, on the value of things and on the importance of and respect for the environment. By stimulating such considerations, the child can salvage the value that is being lost in the current consumer society, where everything must be continually thrown out and renewed, being the love for things. Also imagining the previous life of objects in one’s surrounds can evolve within the child many possibilities for creative writing. Along the lines of the previous book, a simple cardboard box can give the child reading this book an infinity of possible and paradoxical situations, which evolve going back in time. From a simple box of sweets, a gift from an aunt, to the box that contained letters from an unsuitable boyfriend, to the devices of an inventor uncle and an even crazier cousin, this simple box had a truly daring life. Even the button that serves as a nose on the Sara and Pietro’s teddy bear has had a very long life. It one belonged to a grandmother who had found it at the bottom of a sack of flour, where it had fallen by mistake from the hands of the wife of the merchant, Boris. Gradually, the story unfolds in time and in imagination. Children can discover the distant origin in the time of the beautiful button, which was sewn on the precious dress of the daughter of the Tsar, Princess Vassilisa. 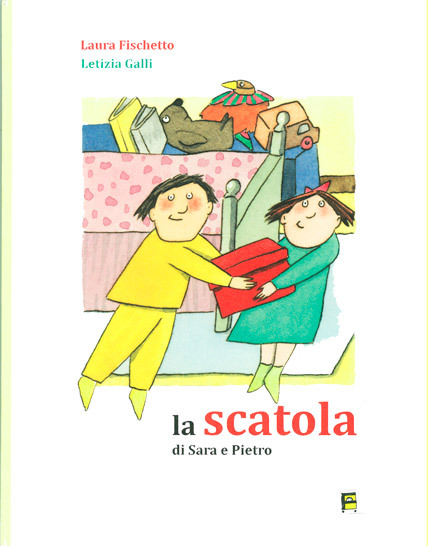 On the occasion of the “Stories of Children” exhibition, Silvana Editoriale has published the Letizia Galli monograph in both Italian and English versions. The monograph, with a wide section of critical texts, traces the career of Letizia Galli from her early works through to 2010. 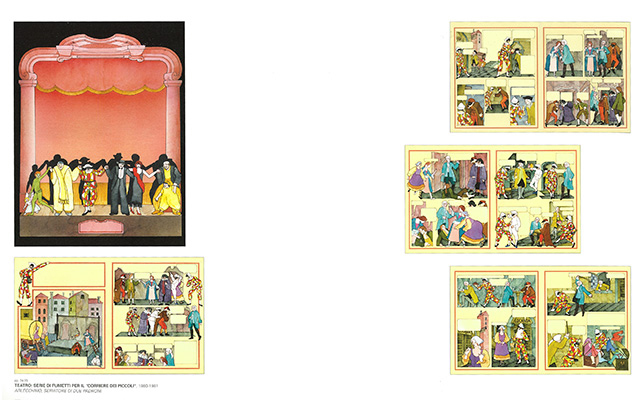 Most of the works published in the 192 pages of the volume featuring just under 300 images are selected reproductions of some of the 2297 original drawings that the artist donated to the MIJ museum (Musée de l’illustration jeunesse) of Moulins, France in 2010. In that year, the MIJ published the monograph in French/English. A small yet exhaustive catalogue was published by Franco Cosimo Panini on the occasion of the exhibition. 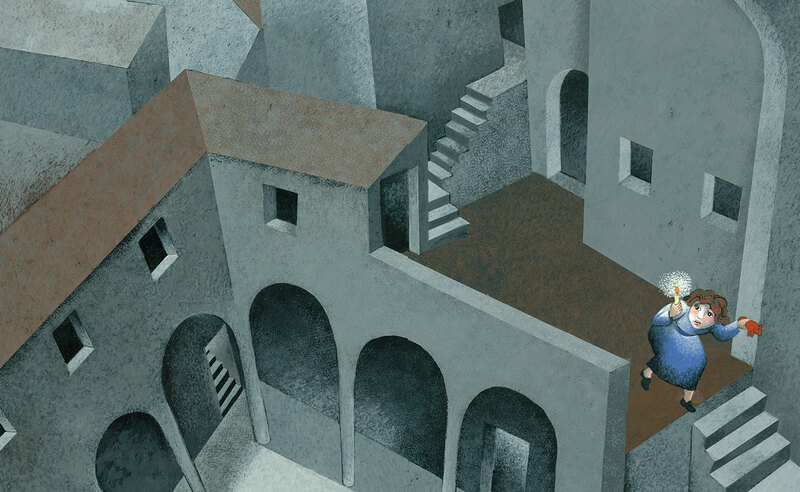 The critical essays of J. Kotwica, E. Delessert, A. Maggi and G. Quarenghi analyse the works of Letizia Galli in several respects, both from an artistic perspective and with regards to her professional choices. The Stories of Children are me! 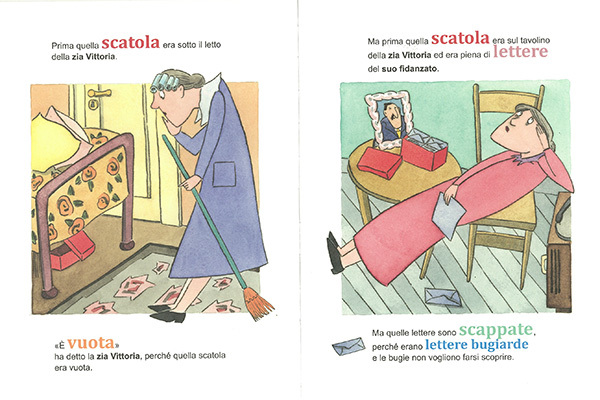 Letizia Galli began her career as an architect before creating a series of gorgeous comics adapted from the great works of theatre and opera for the Corriere dei Piccoli (“Children’s Courier”). 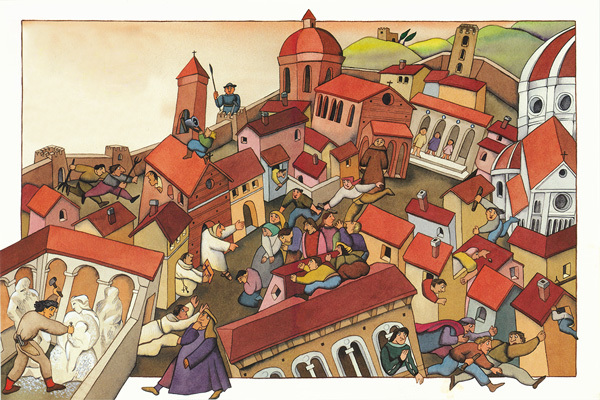 Following on from being published either as an illustrator or writer-illustrator, she created numerous books, mainly in Spain, the United States, Germany and France. 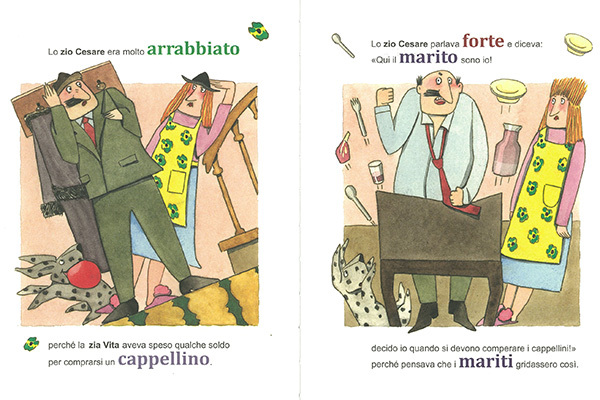 Her main source of inspiration is the artistic patrimony of Italy, dear to her childhood in Tuscan. 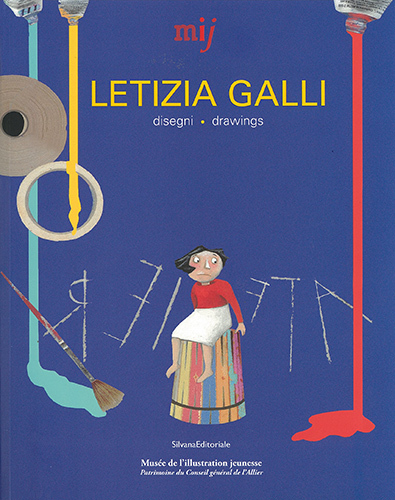 On her own or together with a range of authors, Letizia Galli creates books that are brimming with wisdom and, at the same time, imagination so as to render accessible to children the artistic universe of Leonardo da Vinci and Michelangelo, the cinema of Fellini to which she dedicated a book (Premio Encres et argent, 1994), of historical figures such as Christopher Columbus, characters from the Commedia dell’Arte, the Greek-Roman myths (Premio Octogone, 1991) and the Bible (72 episodes of a television series, 1987-1988, then books translated into 27 languages). In 1989, Franco Cosimo Panini founded the publishing house that bears his name, following on from the sale of a famous figurine company created together with his siblings. 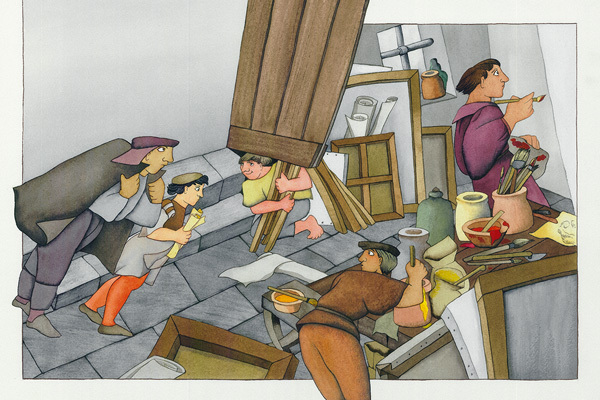 Since then, the publishing house has produced volumes on art, children’s books and products for schools. In the world of art books, it is esteemed for its reproductions of precious illuminated manuscripts and for the “Mirabilia Italiæ” collection, dedicated to the main monuments around Italy. 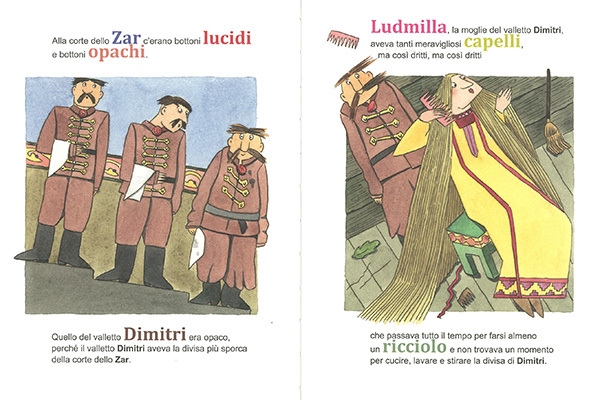 Amongst the numerous publications on art and history, it is distinguished by the series by Dario Fo dedicated to the greatest Italian painters. Franco Cosimo Panini collaborates with important Italian museums, including the Museo Egizio in Turin, for which it is the editor of reference. In the school department, the flagship brand is Comix, a real “cult” amongst young people. Born as a weekly publication distributed through newsstands, Comix evolved into a school diary in 1994. 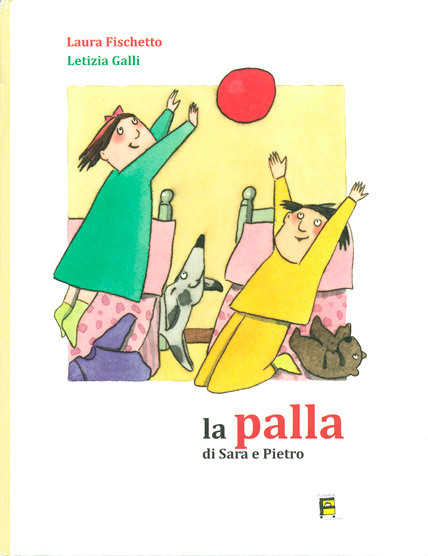 In the same year began the company’s association with Altan, the author of Pimpa, the polka-dot dog who turns her curious focus on the world, leaving an imprint on the entire youth catalogue of the publishing house. 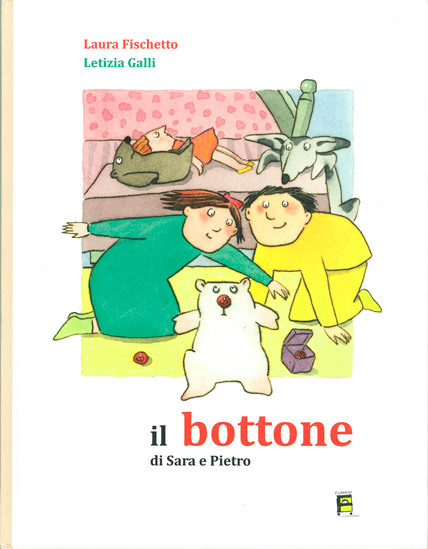 The Zerotre line has been developed for the youngest of readers, following the stages of growth of the child from the cradle to kindergarten. 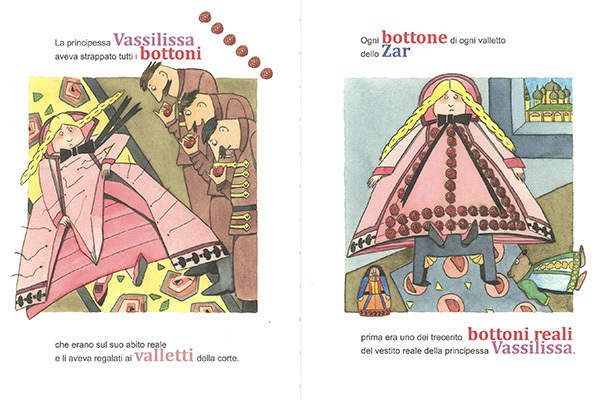 A large section of the catalogue is dedicated to another beloved character, Giulio Coniglio (Julio Bunny). 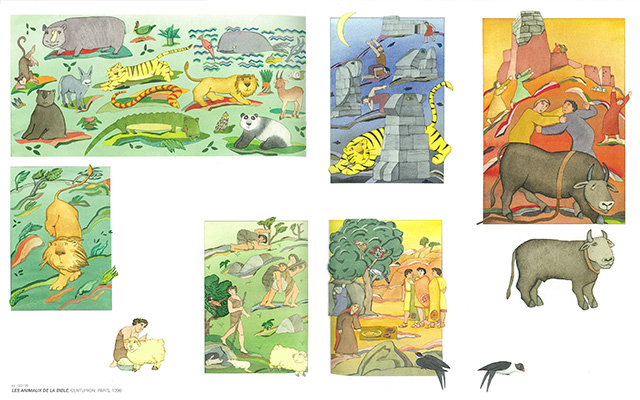 There are also narrative and informative books, which stimulate learning through games that have been created in collaboration with authoritative partners such as FAI and WWF, and the artist books intended as an expression of different styles and languages, which stimulate the child to liberate their own imagination. 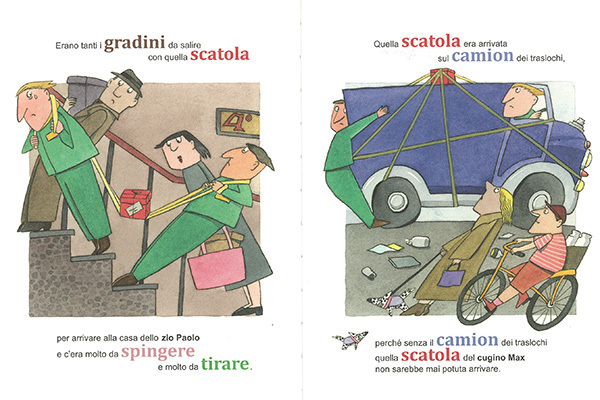 Since 2015, an unprecedented collaboration has been underway with Ferrari S.p.A. for the development of a published collection for children entirely inspired by the automobile brand. 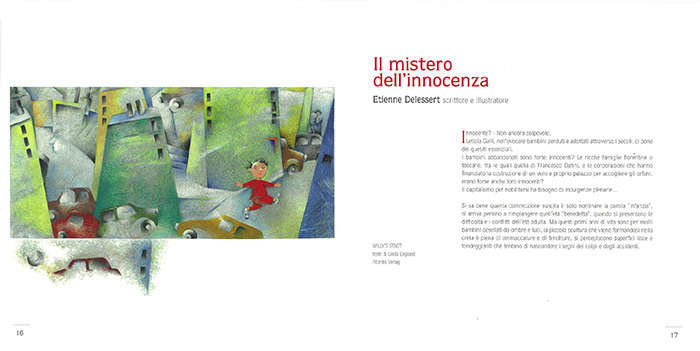 Franco Cosimo Panini chose to be part of the “Stories of Children” project both by publishing the new title written and illustrated by Letizia Galli, “Agata Smeralda”, along with the exhibition catalogue. 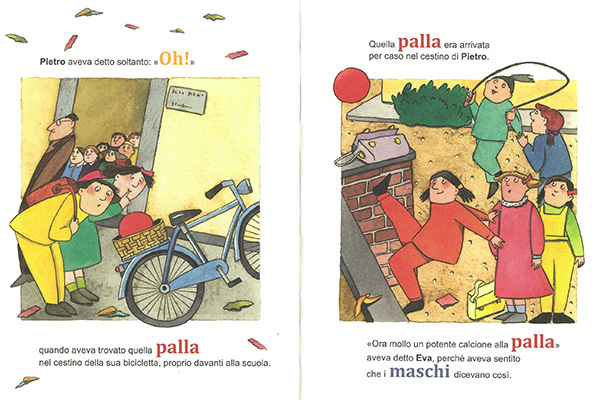 The publishing house in Modena will also be producing a range of associated products, such as pencils, notebooks and posters.